Bixler’s ToobSeal ® Interior Sealer, quart, stops slow seam leaks and porosity in both Hypalon and PVC inflatable boats using an extraordinary acrylic based formula. Buy 2 or more and save $2.00 each. Since 1994, our own Bixler’s ToobSeal Interior Sealer, quart, has been stopping slow seam leaks and porosity using an extraordinary flexible acrylic based formula. Our Interior Sealer is for use with both Hypalon and PVC inflatable boats, whitewater rafts, and is perfect for the old leaky Zodiac, Avon or Achilles inflatable. Unlike other brands which are Latex, ToobSeal ® is the only sealant made of Acrylic which dries clear and smooth and doesn’t yellow and crack. Our exclusive self leveling formula will seal your slow leaks more effectively and if you should spill some on your inflatable or garage floor, it won’t cause an impossible-to-remove yellow stain. The above picture shows ToobSeal ® drying clear and smooth on top and a Latex sealant drying cracked, bubbled and yellowed. 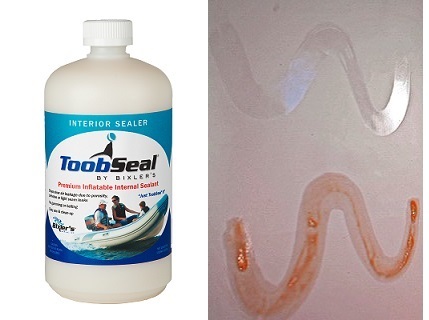 No other inflatable boat sealant comes close to our ToobSeal formula. Our safe and easy-to-use sealer adheres to the interior fabric of the tube, sealing slow leaks and prevents potential future leaks from arising. Hard to find leaks are treated and cured from the inside. That’s why the US Marine Corps trusts and uses ToobSeal. Also works on airfloor boats but needs to be re applied every year or 2. The special formula encapsulates when dry so there is no chance of your inflatable boat fabric self adhering and making re-inflation hopeless. This is why our Interior Repair Sealer has been used by boaters and boat service facilities since 1994. One quart bottle will seal a 10′ inflatable boat or raft, 6 air mattresses or 25 4′ pool toys. 2. Inject 1 quart (32oz) Interior Sealer equally into all the air chambers. 4. Shift the boat side to side and bow to stern at a 45 degree angle until the sealer has circulated and coated all inner surfaces of the boat. Sealer has the consistency of water so it is easy to apply. 5. Let dry for three hours. Boat is sealed! ToobSeal has an indefinite shelf life and can be stored anywhere. 1. Follow above instructions using roughly 3 oz of Interior Sealer per foot as a quantity guideline. 2. If the boat is too large or heavy to “tumble”, then take the boat out and do some wave pounding. For repair paint, see Liquid Rubber in related products below. Excellent product and a definite recommended buy. Used this on a Zodiac C285S from the 90’s. Had patch work done by professional marine and inflatable boat repair service. Following that the tubes were still deflating (noticed after leaving it inflated after day on the water and would find it sagging the next day). Read reviews on product and how to use it. Purchased it and was astonished with how well it worked! Utilized proper directions provided on bottle accordingly. Kept it inflated for recommended amount of time, deflated it, and inflated again to determine integrity. Worked as advertised! Fixed boat, happy boater, happy customer. We had a small leak next to the rubrail. We used Toobseal as directed and it made it’s way to the hole right away. That was a week ago and it’s still holding. We’re impressed and so are our marina neighbors. Great product. Bixler's ToobSeal ® Interior Sealer, gallon, stops slow seam leaks and porosity in both Hypalon and PVC inflatable boats using an extraordinary acrylic based formula. Vinyl Repair Kit with adhesive for Airhead, Sevylor and Coleman Towables, Inflatable Mattresses and Pool Toys. Toluol Cleaning Solvent, 1/2 pint. For Hypalon boats.